In the words of the band: "In August we're doing a few dates with our Finnish friends Cigarette Crossfire, who play rather delightfully good punk rock. They sound a bit like Manifesto Jukebox playing the more upbeat Hot Water Music songs, or something like that. We had a cracking time with them in Finland last summer and it's now time for the return leg. Can't wait..."
It's always a pleasure to show a tour poster for The Amistad in full and the work of Calvinball's Joe Lawrence never dissapoints. All dates can also be seen on our gigs page. The Amistad will also be playing the Bombed Out 15th Anniversary all-dayer on the 5th October at The Brudenell, Leeds, alongside Dugong, The Dauntless Elite, Caves, Wooderson and more. Our favourite gruff punks, The Amistad, are touring around Europe throughout the month of August. In related news, the band are 4 songs into the writing of their next album which we reckon is going to be a little bit special. Hopefully that will see the light of day early 2013. After playing a short run of gigs with The Dauntless Elite earlier in the year, The Amistad are heading back on't road. The band are playing a load of gigs in the UK throughout April and May, including a couple of Scottish gigs, again with The Dauntless Elite and, believe it or not, a gig in Sheffield as Four Dumb Kids. Four Dumb Kids contained 3/4 of The Amistad and more or less evolved into said band, releasing a 7" and an album in the process (have fun tracking those down!). I believe this is a one off reunion so try and make it if you can! Sun 1st April - Fish Tank, Durham w/ ONSIND, Eric Ayotte and a film screening! Fri 13th April - Bird's Nest, Deptford, London w/ Pure Graft and It's Not OK! Later in the year The Amistad will also be heading to the continent for some gigs around Europe. Will post those dates as soon as I have them. Here's an update with some of the reviews that The Amistad have gotten with the Kept Under By A Generation of Ghosts album. South Yorkshire punks' accomplished debut gull length. If you love the gritty melodies of The Lawrence Arms and Alkaline Trio and the Northern wit and satire of Leatherface and Milloy then you need The Amistad in your life. Following on from two split 7's in their two years as a band comes their debut album, filled with the kind of anthemic yet raw political punk and occasional acoustic folk that'll win your heart after a couple of spins. Paying homage to Lifetime on 'Thorpe Hesley's Best Dancers' and elsewhere lamenting aging and non-descript high streets, this is a passionate, confident release that you cannot afford to miss out on. 4/5. Wasn't familiar with these chaps but lordy am I happy I am now! This top drawer No Idea/HWM style punk rock but with that magnificent UK twist that few bands manage to pull off, I'm thinking about bands like Milloy and a few other truly great Yorkshire bands. The promo sheet also mentions the Chicago sound circa '90's and I can see what they mean. A full album of top tunes, so good it flies by! The lyrics are well thought out and excellently written, some personal some about bigger stuff, and sung beautifully. And the artwork is some of the best I've seen in quite some time. This album demands to be purchased and loved! After having put the band on a compilation I'd released earlier in the year, I was looking forward to The Amistad's new album. With a sound somewhere between gritty punk rock and a more indie sound, The Amistad are an intelligent band who have just about the right mix of melody and power in their songs. Of the new album, track 3 'No Hope, Radio!' is probably the strongest, with some great backing vocals, leading into a great sing-along chorus. I can definitely picture fists in the air. Coming from Sheffield (and surrounding towns), the (northern) British accents and topics are clear throughout, and luckily don't fall into the trap some others of this ilk have been guilty of by trying to be a bit too gruff with the vocals. Overall, Kept Under By A Generation Of Ghosts is a great listen, with a good mix of pace throughout, and will definitely find a welcome place in many No Idea Records fans CD shelves. have to apologise to The Amistad and Steve at Bombed Out because I've had this release for months and months - and given it a decent spin too - and just not written anything about it. I can't even give a decent excuse for my tardyness. So I am very sorry and I hope this is better late than never! The Amistad feature ex-members of Four Dumb Kids and although they've been together since January 2007, this is their debut album. They've released a couple of splits - with Above Them and Orphan Choir - so if you heard either of those you will know what to expect from Kept Under By A Generation of Ghosts. It's distinctly 'Yorkshire' in its punk rock approach, part Milloy, part classic Bombed Out sound. And with song titles like 'People who live in Glasshoughton shouldn't throw stones' what else would you expect? Vocally it's very British, there are no faux-Yank accents on show. The vocals are impressive throughout actually and the backing vocals create some decent harmonies. They're not the poppiest of gruff pop punk bands (clumsy description alert) but there are enough melodies and harmonies rattling around to keep everyone interested. I know I'm lazy to say it, but if you liked the classic Leatherface-esque bands that made the Leeds scene so vibrant and exciting in the early 2000s, you will love this record. Simple as that. The arrival of this CD in my letterbox couldn't have been timed better, spring has seemingly jumped up to say hello and The Amistad are providing a great soundtrack (don't worry, its out on vinyl as well.) The Amistad hail from Sheffield, which will become fairly noticeable as soon as this album starts to spin (no faux American accents here). Some of you may well recognize the band from their previous incarnation as Four Dumb Kids, and this pretty much leaves off where that band finished ; Their brand of gruff pop/punk brings to mind bands like Leatherface, Latterman and Dillinger Four (although with a distinct UK twist ). Even though this sound has been done to death, they pull it off well thanks to a group of songs that are pretty varied in pace and feel. The best example of this is the sparse, haunting acoustics of "An Unobscured view..."that suddenly jumps into the catchy and pace ridden "So This is Where The Fun Times End..."which incidentally has one of the best opening lyrics I've heard in a long time. The ebb and flow of this album makes it a real pleasure to listen to - make no mistake, this is a well crafted album, not just a collection of songs thrown onto a CD as seems to be the trend these days. Throughout these songs there are some great vocal and instrumental breaks, these prevent the songs falling into mid paced mediocrity and add some real drive and urgency that translates into the urge to dance around like a loon. Add this to some utterly infectious lyrics and you've got something pretty special indeed. Vocally is where this album shines, with some great melodies that are accompanied by some dry humour, stark honesty and a pinch of politicism. It is also the vocals that mark the most noticeable change from their previous releases, with the backing vocals providing some great harmonies. This adds to the accessibility of the tracks and helps to give these guys an identity beyond the hordes of bands shouting their way through Leatherface rip offs. There is a slight absence of truly memorable riffs here, but this a pretty small complaint given the standard of the songwriting on display. My other complaint is the ridiculously long song names, which is mainly because I can't be bothered to type them out and use up precious words! If you're a fan of gruff, honest punk rock then you can do a lot worse than pick this album up. If you're a bit unsure then I'd thoroughly recommend checking out the split with Above Them that came out on Disillusioned last year. I picked up a copy of the Above Them/The Amistad split when it first came out a few months back and was more than impressed with these Northerners. Catching them live in Norwich a few weeks back only cemented the fact that this band are summat special. However, getting home and putting on their new album did honestly blow me away. Everything about The Amistad seems honest; from their impassioned thought provoking and extremely intelligent socially aware lyrics, to the intricate ever so slightly techy gruff melodic-punk. Incredible artwork and a loving attention to detail all round. Ey, this really did warm my heart did this one, surely this has a claim to be in the top 10 albums of the year when it comes to the end of 2010. "Have you ever tasted a fresh tomato? They don't taste so similar to the ones we get in Tesco. Drowned in systemic pesticides and selectively bred for thicker skin and longer life, all in the name of blemish free fruit and veg"Classic. hough I feel as I just reviewed the Amistad's Kept Under by a Generation of Ghosts when discussing Orphan Choir's self-titled, the UK's unintended answer to that band and album is assuredly worth a mention as well despite the obvious aesthetical and musical similarities. You've heard the Amistad's sound before, but the band bless it with a boisterousness and steadiness that allow the rough melodies and moments of subtle emotional resonance of their debut to come to life. There's lots of talk of Chicago and the Broadways as having an influence on the band in press materials, and you can hear that to a certain extent, especially in something like 'The Youth Aren't Getting Restless.' Myself, I want to say there are some typical A Flight and a Crash-era Hot Water Music and the Gaslight Anthem circa Sink or Swim twinges in here, but the band aren't as aggressive and technical as the former nor as nearly soulful and dynamic as the latter. But the straightforwardness they adhere to isn't too detrimental to their sound as a whole; they get by on sincere, slightly ragged vocals and rugged tempos that sound natural for them, as well as a heavy literary influence that gives their songs an intelligence and maturity over the opportunity for mindless, beer-swilling anthems. Little flairs here and there help make Kept Under a little more than an average Orgcore album. 'Thorpe Hesley's Best Dancers' makes two cute Lifetime references; the other is its introduction, nipping that of 'Turnpike Gates''s. Then the second half kicks off and it's actually better than the first. 'An Unobscured View of the Sewage Works' is an articulately told, short acoustic narrative where the band's Yorkshire accent is especially noticeable. 'Blemish Free Fruit' and 'Shall I Be Mother?' suddenly find the band at its most rambunctious and brassy, yet the latter traverses a slow ending I hope they explore more in the future; regardless, I really like the sudden aggression on these and hope it's a territory they explore more as well. The heart-fluttering chords and Gin Blossoms-esque opening to closer 'Beer Guilt Schulze' is also unironically great. The liner notes and artwork to the album are warmly old-fashioned and borne with sharp, clear images and text like an old Dickens novel. I want to like Kept Under by a Generation of Ghosts way more than I actually do, but it's hard to deny both the promise and immediate enjoyability that the Amistad already possess. 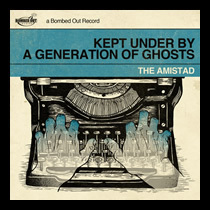 The coincide with the release of their debut album (Kept Under by a Generation of Ghosts is out in the shops April 12th) The Amistad will be taking their sweet melodies all over the UK as part of their 2010 "Real Ale" tour, starting April 9th. The band will have the album available on CD and LP for the first time at these gigs. All the tour dates are on our gigs page now or keep up to date (and invite your friends!) on Facebook here: http://www.facebook.com/event.php?eid=373394830241&ref=mf. Get to a gig and get involved! The artwork for The Amistad album is coming together nicely as you can see. Expect a CD and LP release (co-released by Disillusioned Records) in the new year. Bombed Out's are proud to announce the addition of a new band to the family (yay! new blood! ): The Amistad have now joined the fold. No strangers to the label after we received every Four Dumb Kids demo they recorded, The Amistad take the sound of mid-90s punk rock and add their own imitable Yorkshire charm to create a sound that's been compared to Milloy covering The Broadways. The band have already recorded and released two fantastic split 7"s with Orphan Chair and Above Them and have now recorded a cracking debut album too. Kept Under by a Generation of Ghosts will be released on Bombed Out early 2010. For a preview and for more on the band please see their profile page.